Richard understands that some people who know him from his past may look at him today in disbelief. He is one of the 31 individuals featured in the new ADAMH campaign, “Where Better Begins.” Richard’s “better” began in an unlikely place: with a toxic relationship where, after one of their bigger fights, his girlfriend told him that he was “crazy.” With that one word, she caused him to eventually look at his life in a new way. Richard started to change for his girlfriend, but now realizes just how much he has improved for himself. “Everywhere, but especially in the black community, it’s taboo to talk about your mental health,” Richard explained. This is something he now likes to call “mentalphobic,” where people are afraid to talk about mental health issues because of the stigma associated with them. Although he had experienced suicidal thoughts, he never considered mental health as a potential factor in his life struggles until he was in his early 30s. Richard remembers many years where he would allow alcohol and marijuana to take up most of his time and money. All the way back to his high school years growing up in Columbus, he remembers taking water bottles full of liquor to class. As an adult, he would take shots of alcohol in the morning before going in to work and enjoyed going to relaxed bars after his shift where people knew who he was and what he wanted to drink as soon as he stepped in the door. He also used food as a way to escape from his mental struggles, allowing his weight to balloon up to 400 lbs. After years of alcoholism and a visit to Netcare, Richard was connected to a counselor at North Community: Lisa Bishop. Richard decided to come back and he is so glad now that he did. He now knows that he had been silently struggling with Depression, Anxiety, and ADHD for years. Richard has had two counselors at North Community over the last seven years, Lisa Bishop and Yolanda Board, and he says they are two of the very few people he has never lied to. He understands that they are there to support and help him, as long as he stays open and honest with them. Over the years, Lisa and Yolanda have helped Richard work on his outlook on life and have connected him with rehab and crisis services when necessary. They have also helped him work to make smaller changes in his everyday life that make a big impact. He is learning to stop being offended as easily and to change his reactions in situations where he used to lash out. Rather than allowing himself to spiral down the dark path of suicidal thoughts, he is working to realize that he doesn’t actually want to end his life, he just wishes he was somewhere else. When he would normally think, “I can’t,” and give up, he is learning to instead try harder. “You shouldn’t be drinking if you’re depressed,” Richard now realizes. Throughout his work to improve himself, he has also seen others who meant a lot to him lose their battles with substance use disorder and mental health disorders. Now that Richard has worked to improve his own life, he wants to become a better role model for the people around him. He wants to be a good influence in an attempt to prevent future overdoses and deaths due to suicide. Richard hopes to be someone that others can relate to. He grew up in a rough area with a difficult home life where he was abused and didn’t know how to deal with other people. Now, he wants to show others with a similar backstory that a successful life in recovery is possible. Richard is now working as a custodian for a school system and is a recreation leader for the after school programs where he helps kids in Kindergarten through 5th grade. He never thought he would be here, in a town that he once thought would never accept someone like him, but now he credits this school system and his counselors at North Community for giving him a second chance at life. When he first heard about the position opening to become a custodian, Richard thought it would be a horrible and thankless job, but he decided to give it a chance anyway. He began to change his mentality about going to work each day and, over time, he started to work on changing the perception that others had of him too. He decided to go with a cleaner look, cutting his hair and covering tattoos while working. When others interacted with him at work he made an effort to act upbeat and keep a positive attitude, and when other positions within the district opened up, he applied. It didn’t take long for people to notice. When he was in an interview for another position, a school staff member who had worked with him described him as having a “great personality and a good attitude.” They even went as far as to call him “bubbly.” Richard never thought he would hear those words to describe him, but because of the mentality shift he was able to make, he now has the opportunity to work in a well-paying job and even racks up some overtime. “The school district has really embraced me,” Richard said. They helped to pull him out of a dark place and Richard has been able to use those life struggles as a learning tool to get humble and make drastic improvements to his life. Now, working with kids keeps him going. Their happiness and pure love of life gives him the energy to stay focused and balanced, and each day, life comes easier. Richard is now planning to go back to school with hopes of becoming a teacher or counselor, where he could have even more impact on improving young lives. 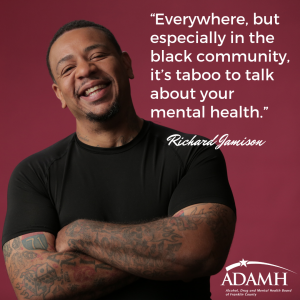 Although he still experiences some stigma in life, due to his race, his tattoos, his decision to live and work in the district, or his mental illness, Richard has been able to make the slow change to adjust the way he reacts to the stigma. In turn, he is able to begin changing the perceptions of those around him. Richard is shattering the stigma.